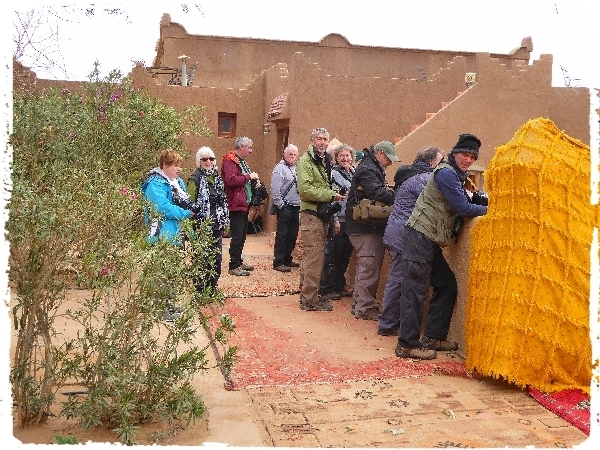 Our desert experience began at 6:45 am as we emerged from our hotel, the weather was bad again, dull and overcast with a biting cold north-easterly wind. It took 15 minutes to drive to our first birding site which was a dry rover bed that stretched for miles into the desert plains from the roadside. 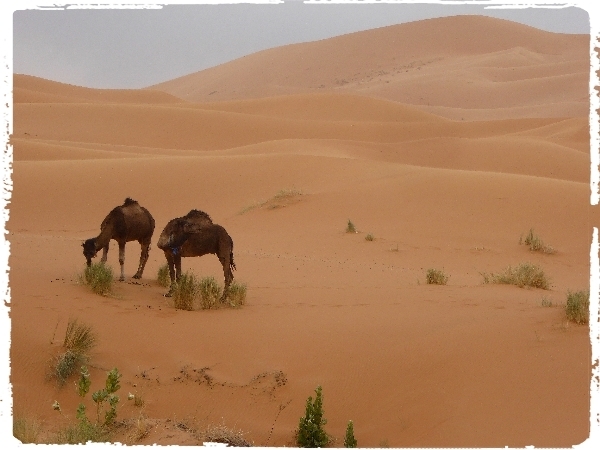 This treeless habitat of sand and large finely spaced clumps of vegetation was ideal for a number of species. We set off on foot, wrapped in winter clothing, walking against the cold wind whilst being sand-blasted. It was amazing that we saw anything at all, but after a few hundred meters we found our main target species the Desert Warbler. This bird was obviously feeding young as it carried food whilst flitting from grass mound to cistus shrub, it often perched on the ground. 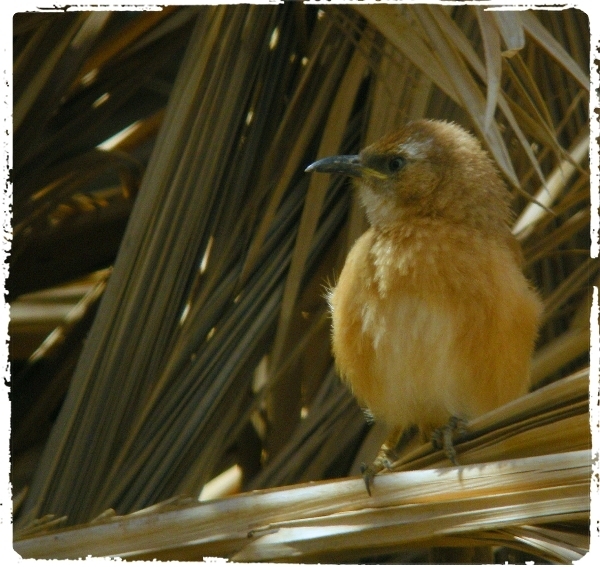 We continued the walk and as the sun broke through the clouds the wind eased a little, we found Desert Wheatear and a second Desert Warbler, several Bar-tailed Desert Larks and a Brown-necked Raven sitting on a nest in the only bush for miles around. 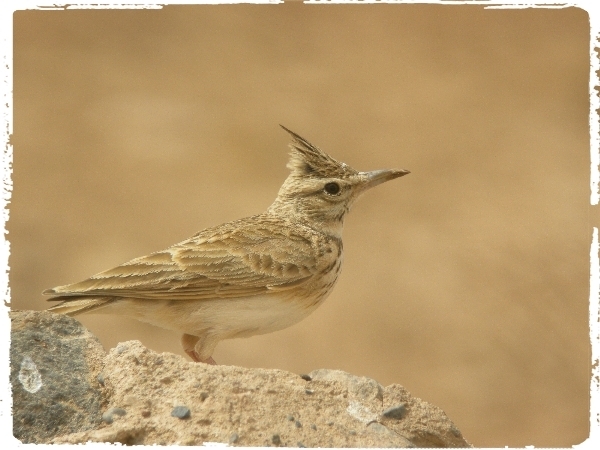 Just before we headed over to the bus one of the group, Dereck, found another most wanted species, the Hoopoe Lark. Back ln the bus we drove another 10 kilometers to the Erg Chebbi sand dune system where a number of well-spaced Auberges were situated. The one we visited was called Café Yasmina, it was built on a rise besides a low-lying area of dense tamarisk shrubs which often floods to form a huge seasonal lake,,alas it was dry this year. After a qiuck cup of coffee walked through the tamarisk bushes and trees, the wind played havoc with our birding yet again but on the lea side of most trees and bushes we found shelter and birds. Many migrant warblers flitted about, the most abundant by far was Bonelli’s Warbler, followed by Subalpine Warbler, then Eurasian Chiffchaff, Common Redstart, Willow Warbler and a few that got away. 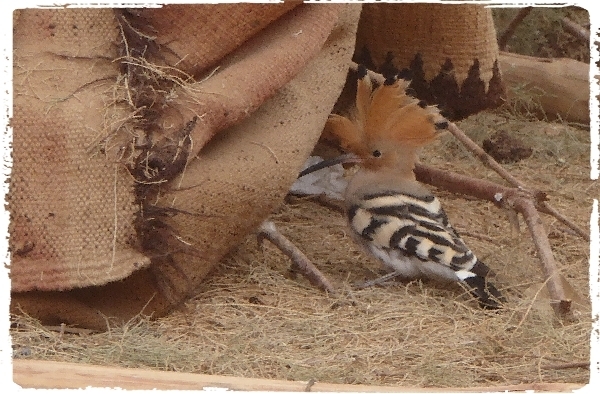 Eurasian Hoopoe, hundreds of House Sparrows, Feral Pigeons and Collared Doves flew around scrub area andthe Kasbah compound. We finished there after watching a number of species coming to drink where a dripping tap had formed a small pool, birds were coming to drink and to bath. We had excellent close views of most of the species mentioned above including an additional Blackcap. From the dunes we drove to Rissani where we took the ‘Tourist Route’ which circumnavigates the town passing through rural landscape and several picturesque villages. We didn’t get far! 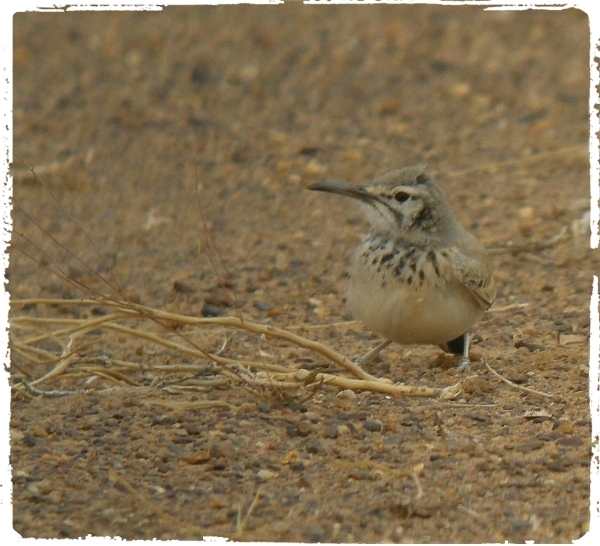 because we stopped to photograph Blue-cheeked Bee-eaters, then we discovered one of our targets, the Long-billed Crested Lark. We also enjoyed Woodchat Shrikes, Trumpeter Finches and a distant Short-toed Eagle. Once back on the bus we travelled just a few hundred meters when we discovered our most wanted, the Fulvous Babbler, not one but a dozen or so. At least an hour was spent trying to photograph them before we turned around and drove into town to buy lunch, job done! From Rissani we drove to Oued Gheris and where a new bridge replaced a ford, we sat to eat our picnic lunch. The river (Oued) was virtually dry but still had small pools, there was also reeds, scrub and lots of Tamarisk. One tamarisk tree held a number of warblers, Orphean Warbler was nice, Bonelli’s and Subalpine proved to very common but we did see Saharan (Olivaceous) Warbler, a smaller, darker, resident, bird than Western Olivaceous and soon to be given species status. 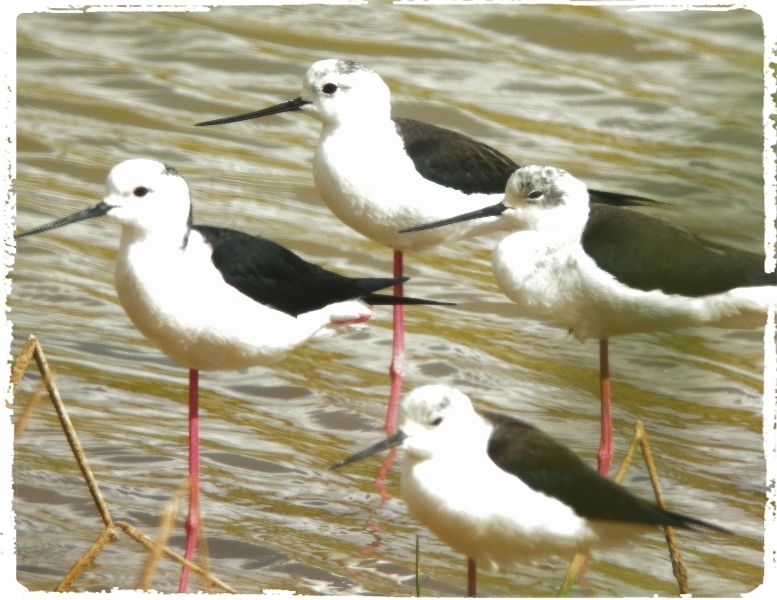 Birds seen around the water included Black-winged Stilts, Green Sandpiper and several Bonelli’s Warbler and a nearby rubbish tip attracted many Brown-necked Ravens, Black Kites and the odd Booted Eagle. That was about the sum total of our findings. We continued along this road where the landscape consisted of islands of huge rock formation lying at an angle and peaking around 100 meters above the ground. These outcrops of rock were surrounded by miles of flat stony plains with large chunks of vegetated sandy areas. We picked up Ali, a local nomadic man, who over the last 15 years has become known as the ‘owl man’ because he finds the Pharaoh Eagle Owl for visiting birders for a little financial recompense. But today he was to guide us to some Sandgrouse so we concentrated our efforts on the flat vegetated areas. Unfortunately after driving for several kilometers we never saw a single sandgrouse. However on the way back we did find two groups of Spotted Sandgrouse, first there were about a dozen on our right and whilst watching them we heard more on our left. About 50 were in the second flock, we drove nearer for a better look but they simply disappeared, amazing not one of us saw them fly off! A mirage perhaps? We left Ali were we found him and drove back towards the hotel, the wind was still a problem and an attempt to see Egyptian Nightjars was abandoned just after it got dark. We had dinner at 8pm.